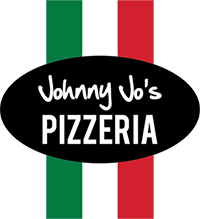 Online ordering menu for Johnny Jo's Pizzeria. Disclaimer : ( We have NO claim to fame for being a New York Style Pizza! This is our family recipe from Sicily and make it with LOVE. If you want New York Style Pizza then go to New York ). At Johnny Jo's Pizzeria we are committed to giving our customers the most satisfying pizza they've ever tasted. Our unique sauces, market fresh ingredients and freshly made dough, gives even our simplest sausage pie that extra special something in each bite that only we can provide. We serve more than just the average pizza. For example, one of our stone oven pizzas is the Tom and Art which includes Tomato and Artichoke on a garlic butter herb sauce topped with mozzarella and provolone. Feeling creative? Build your pizza with our sauce made with San Marzano tomatoes. Our menu also features Garlic Knots, Stromboli, Salads, and more. Come give us a try! Find us on 47th Street between Mercier St. and Holly St. We're not far from Westwood Park, Country Club Plaza, and Saint Luke's Hospital of Kansas City. Order online for carryout or delivery!